I have left The Brit in the UK to work, so off to party I go. On my journey, I will be visiting friends in Eastern Europe and traveling back to the UK by car, visiting all of the countries in between. I am determined to drink as much wine and eat as much of the local cuisine as I can while I am on my trip. For the blog, of course.. Yesterday we visited the finest restaurant in the area and ate traditional Czech food for a large lunch. I will talk about that in another post. When we got home however, out came the alcohol. Our friends made us snacks of open faced sandwiches to go with it. The combination of flavors of these sandwiches was very unusual. 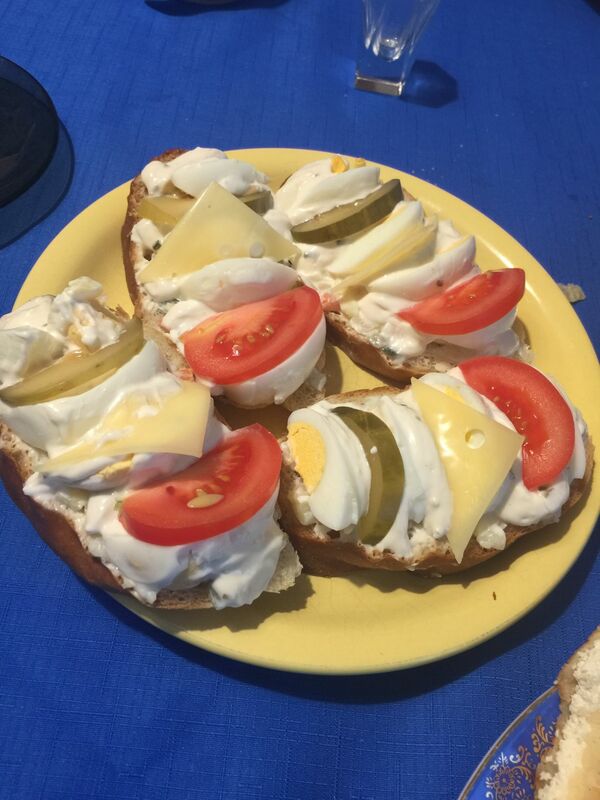 One was sort of an egg salad with cheese and pickles as a combination on a rustic bread. 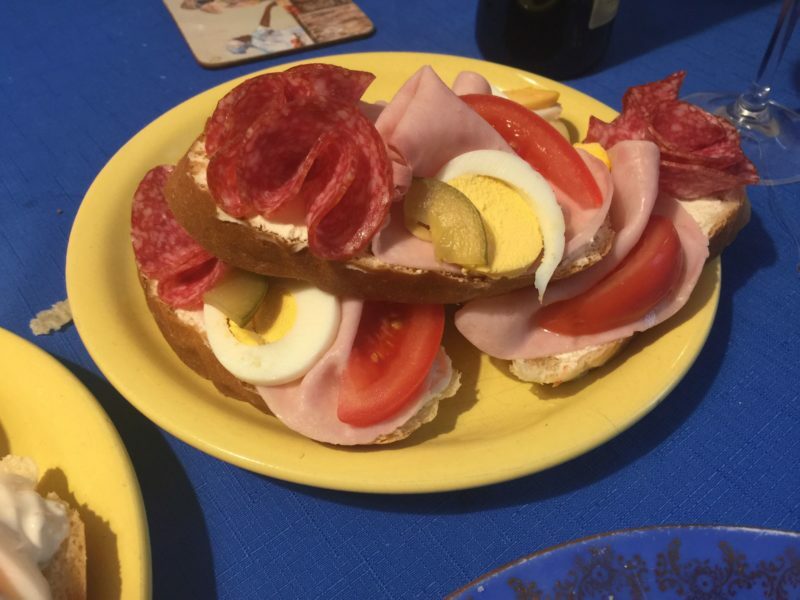 The other was cream cheese, pickles salami, tomato and ham. Wine in the Czech Republic is produced mainly in southern Moravia, although a few vineyards are located in Bohemia. 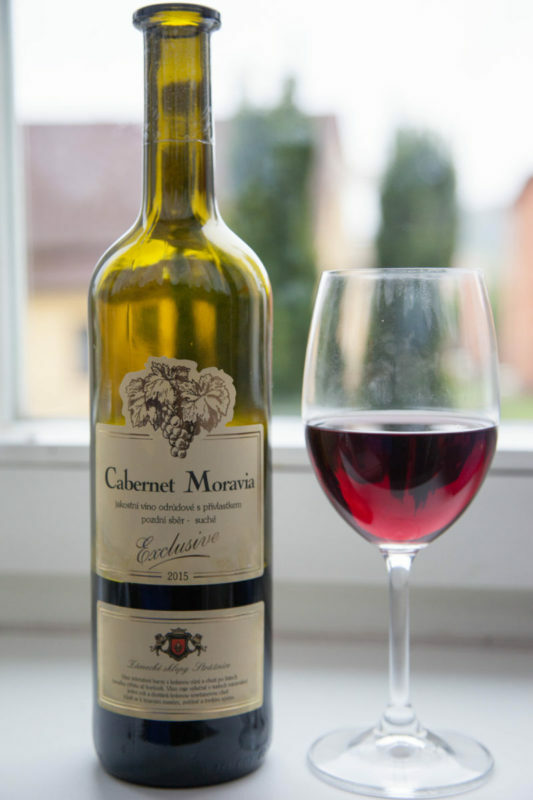 However, Moravia accounts for around 96% of the country’s vineyards, which is why Czech wine is more often referred to as Moravian wine . Production centers on local grape varieties, but there has been an increase in the production of established international strains such as Cabernet Sauvignon. The bottle of Cabernet Moravia was a bit on the sour side. We were unsure if that was the flavor, or if it was corked. Maybe I can get my hands on another bottle to see. We all felt that maybe the bottle was not as it should be so it would be unfair to talk about it. 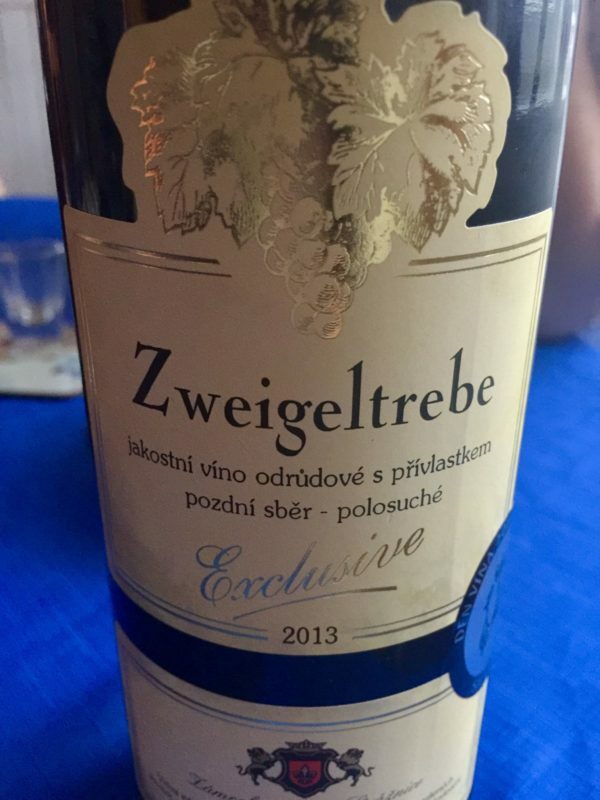 The second bottle which was called Zweigeltrebe and was a 2013 vintage, was absolutely delicious. Talk about being surprised! To me it had all of the flavor of a very good quality zinfandel. It had a nose of dark rich forest fruits, and on the palate was all jam, with blackberries, currants, raspberries and a little spice. It was medium to heavy body and it had a beautiful deep claret color. I loved this wine. I could imagine myself and The Brit relaxing and drinking several bottles of it. Wonderful! The cost of these bottles of wine are about kc140 which equals about $5.60. I would class it as at least a $20.00 bottle If I purchased something of similar quality in California. It was that good. 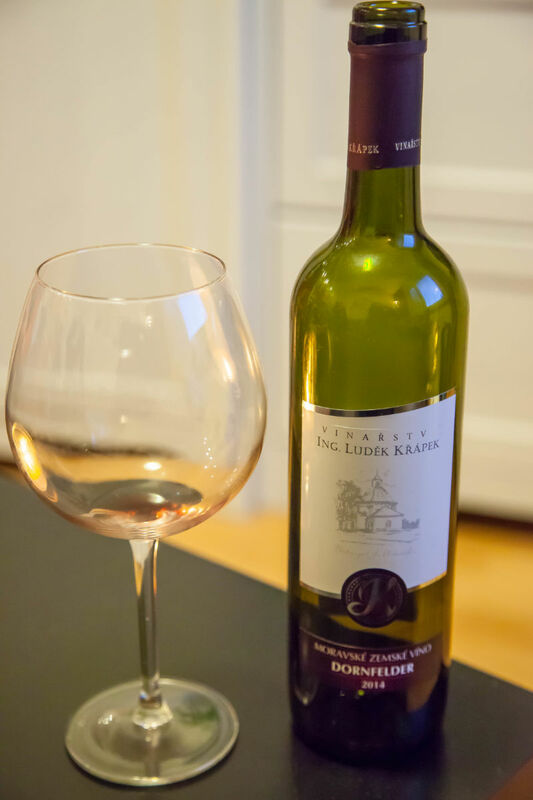 Another friend shared one of her bottle of Czech wine with me and it was amazing. It tasted like a combination of a Shiraz and a Malbec, smooth, nice weight, low tannins and a tiny little bit of spice at the end. It was fruit forward without being at all sweet or cloying. It was my favorite of the wine I drank there. The grape was a Dornfelder and it was a 2014 vintage. 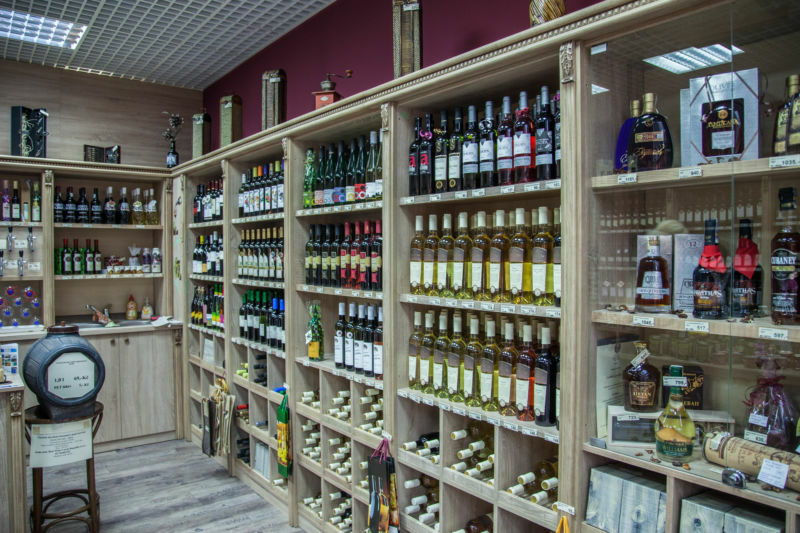 If you haven’t tried Czech wines, I think it may be worth the experience. The wines were good quality and low cost. The beauty of the country and the friendliness of the people make the trip to Czech Republic well worth it!